Trios Fresh Italian aspires to bring you the finest Italian cuisine. Made especially for you, all of their products are homemade from the freshest ingredients. They offer you the option to dine in, take out or deliver to your home or office. 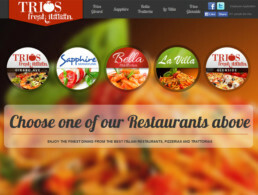 Trios Trattoria, Trios Tomato Pie, Bella Trattoria, Sapphire, and LaVilla are all part of the same Trios Fresh Italian Family.